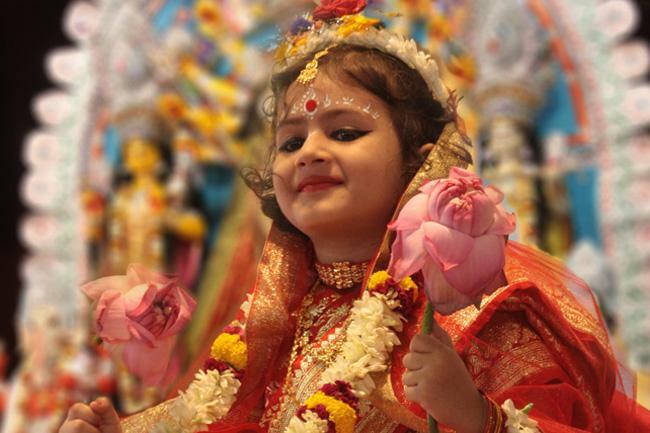 Probashbangla24 online Desk : The Hindu devotees are celebrating Maha Ashtami, the most auspicious of the five-day Durga puja festival, at different Puja mandaps across the country. The main attraction of Maha Ashtami is Kumari Puja in which a pre-pubescent girl is worshipped as ‘Mother Goddess’. The rituals began around 11:00 am where girls were worshipped as the goddess at Puja mandaps, including capital’s Ramkrishna Mission Temple. The worshipped girl symbolises the power that regulates creation, stability and destruction on earth. The celebrations mark the triumph of good over evil. In old days, a buffalo was offered as sacrifice to the goddess. These days, bananas, pumpkins and cucumbers replaced the animal. Also known as Maha Ashtami, the day holds special significance in the social and religious calendar of the Hindus. Devotees of all ages are flocking to Puja mandaps to offer flowers at the feet of the girl Goddess Durga.